Replica Of is a feature of Redis Enterprise Software (RS) where an administrator designates a database to be a replica (destination) of one or more databases (sources). Once you have done so and the initial data load from source to destination is completed, all write commands are synchronized from the source(s) to the destination. This allows you to keep a database (destination) that is an exact replica of a database. ReplicaOf is uni-directional replication between databases, either within a cluster or between clusters. It should not be confused with Geo-Replication via CRDBs, which is bi-directional replication between N+1 databases on separate, possibly geo-located, clusters. This configuration can be very useful, for example, if you would like to distribute the read load of your application across multiple databases. In addition, this feature can be used for carrying out a one-time synchronization of a database, either within RS or external to RS, to another database. Warning: Configuring a database as a replica of the database that it replicates creates a cyclical replication and is not supported. The Replica of is defined in the context of the destination database by specifying the source databases. A destination database can have a maximum of thirty-two (32) source databases. If only one source is defined, then the command execution order in the source is kept in the destination. However, when multiple sources are defined, commands that are replicated from the source databases are executed in the order in which they reach the destination database. As a result, commands that were executed in a certain order when compared across source databases might be executed in a different order on the destination database. Note: The Replica of feature should not be confused with the in-memory Database replication feature, which is used for creating a master / slave configuration that enables ensuring database high-availability. For a quick overview of ReplicaOf capabilities watch this quick video. RS has a security mechanism in which an internal admin password is assigned to each database. This password helps protect the database from being used as a replica source and is required in order to define another database as a replica target of this database. 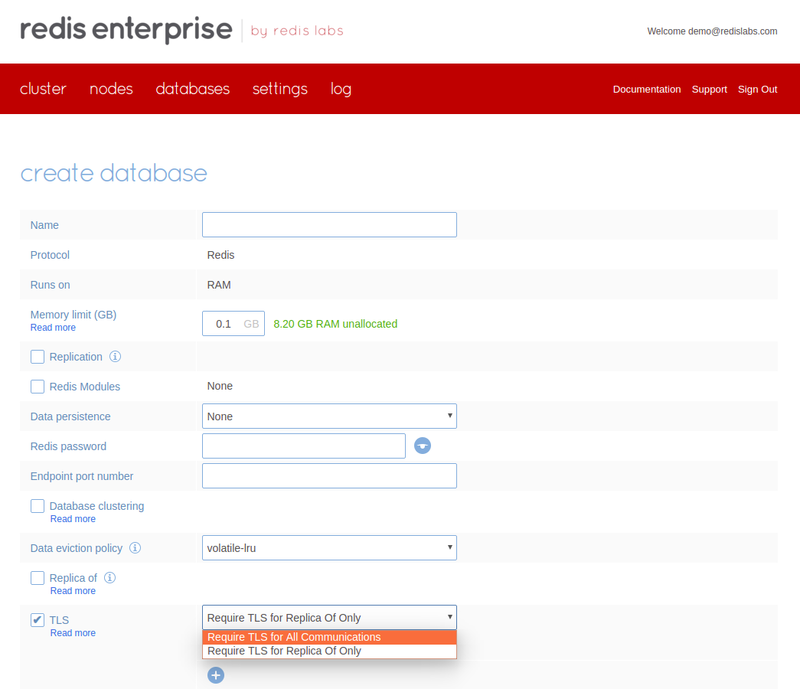 The source databases can be located in the same Redis Enterprise Software (RS) as the destination database, in a different RS, or they can be Redis databases that are not part of an RS. When a source database is from within RS, the source URL has the following format: [database name]: redis://admin:[internal database password]@[database endpoint with port] where the internal database password is the password automatically assigned and populated by RS. In the RS management UI, when you enter the textbox to define a replica source from within the target database page, the list of existing databases is shown with the appropriate URL, including the internal admin password, already set up. When a source database is from a different RS, the source URL has the same exact format as indicated above (except for the [database name]: prefix), but in this case, the URL does not show up as an option in the UI. In order to configure the target database as a replica of a database from a different RS, you need to extract the source database URL, including the internal admin password, from the source database. This can be done in the UI from the source database page by clicking the Get Replica of source URL link next to the Endpoint field. In addition, you can regenerate the internal admin password from the same UI. If you regenerate the internal admin password, any existing replica destinations already configured will stop working until you update them. Compression: when a source database is located on a different Redis Enterprise Software cluster, there is also an option to enable compression of the data being replicated. For additional details, refer to the "Replica of" data compression section. When a source database is external to a Redis Enterprise Software cluster, the source URL has the following format: redis://:[redis password]@[hostname]:[port] where the password is the Redis password assigned by the user, represented with URL encoding escape characters. If no password was defined for the database, the following format should be used: redis://hostname:port. When multiple sources are defined there is no meaning to the order in which they are defined or presented. If you make changes to the definition of the sources (such as editing, adding or deleting a source), then the synchronization process is restarted from scratch for all the source databases. Note: If you used the mDNS protocol when naming the cluster name (FQDN), make sure that the client mDNS perquisites are met in order for the Replica of feature to work. For additional details, refer to the Client prerequisites for mDNS. When a database is defined as a replica of another database, all its existing data is deleted and replaced by data that is loaded from the source database. Once the initial data load is completed, an ongoing synchronization process takes place to keep the destination always synchronized with its source. During the ongoing synchronization process, there is a certain delay between the time when a command was executed on the source and when it is executed on the destination. This delay is referred to as the Lag. When a synchronization error occurs, then depending on the error type, the process might stop, or it might continue running on the assumption that the error will be automatically resolved. See more details below. In addition, the user can manually stop the synchronization process. When the process is in the stopped state - whether stopped by the user or by the system - the user can restart the process. Restarting the process causes the synchronization process to flush the DB and restart the process from the beginning. Syncing - indicates that the synchronization process has started from scratch. Progress is indicated in percentages (%). Synced - indicates that the initial synchronization process was completed and the destination is synchronizing changes on an ongoing basis. The Lag delay in synchronization with the source is indicated as a time duration. Sync stopped - indicates that the synchronization process is currently not running and the user needs to restart it in order for it to continue running. This status occurs if the user stops the process, or if certain errors arose that prevent synchronization from continuing without manual intervention. See more details below. The statuses above are displayed for the source database. In addition, a timestamp is shown on the source indicating when the last command from the source was executed on the destination. The system also displays the destination database status as an aggregate of the statuses of all the sources. Note: If you encounter issues with the Replica of process, refer to the troubleshooting section Replica of repeatedly fails. Certain errors that occur during the synchronization process require user intervention for their resolution. When such errors occur, the synchronization process is automatically stopped. For other errors, the synchronization process continues running on the assumption that the error will be automatically resolved. Error authenticating with the source database. Cross slot violation error while executing a command on a sharded destination database. Out-of-memory error that occurs on a source or on the destination database. Connection error with the source database. A connection error might occur occasionally, for example as result of temporary network issues that get resolved. Depending on the connection error and its duration the process might be able to start syncing from the last point it reached (partial sync) or require a complete resynchronization from scratch across all sources (full sync). Click to create a new database. Click on the database that you want to configure and at the bottom of the page click edit. For a new database - Require TLS for Replica Of communications only is selected by default. For an existing database that is configured to Require TLS for all communications - Select Require TLS for Replica Of communications only. By default, client authentication is enforced so you must enter the syncer certificates of the clusters that host the destination databases. In the syncer certificates box, copy the entire text of the certificate. Click to open the certificate box. Paste the text of the certificates in the box. Click to save the certificates. You can also clear Enforce client authentication so that all clusters or clients can connect to your database without authentication. To encrypt Replica Of synchronization traffic, you must also configure encryption for the destination database. Click on the database that you want to configure and at the bottom of the database page click edit. Enable TLS and select Require TLS for all communications. By default, client authentication is enforced so you must enter the syncer certificates of the clusters that host the destination databases. The certificates of the clients that connect to the database. Copy the entire text of the syncer and client certificates. Press the Continue button, save the certificate and Update the database changes. When the Replica of is defined across different Redis Enterprise Software clusters, it may be beneficial to compress the data that flows through the network (depending on where the clusters physically reside and the available network). It uses CPU and disk resources to compress the data before sending it to the network and decompress it on the other side. It takes time to compress and decompress the data which can increase latency. Replication is disk-based and done gradually, shard by shard in the case of a multi-shard database. This may have an impact on replication times depending on the speed of the disks and load on the database. If traffic is too fast and the compression takes too much time it can cause the replication process to fail and be restarted. It is advised that you test compression out in a lower environment before enabling it in production. In the Redis Enterprise Software management UI, when designating a Replica of source from a different Redis Enterprise Software cluster, there is also an option to enable compression. When enabled, gzip compression with level -6 is utilized. If a source database is sharded, that entire database is treated as a single source for the destination database. If the destination database is sharded, when the commands replicated from the source are executed on the destination database, the destination database's hashing function is executed to determine to which shard/s the command refers. The source and destination can have different shard counts and functions for placement of keys.